We love having breakfast for dinner and this is a great casserole for that! It would also be perfect for brunch. It’s simple to make and both kids loved it, which is a win right now since Madeline no longer likes the food that she loved before and Cooper is getting picky and only wants mac and cheese. I know we’ll be having this for dinner quite often. It’s great for leftovers in the morning…cut a slice and reheat it in the microwave. Preheat oven to 375 degrees. Spray a 9×12 glass cooking dish with nonstick cooking spray. 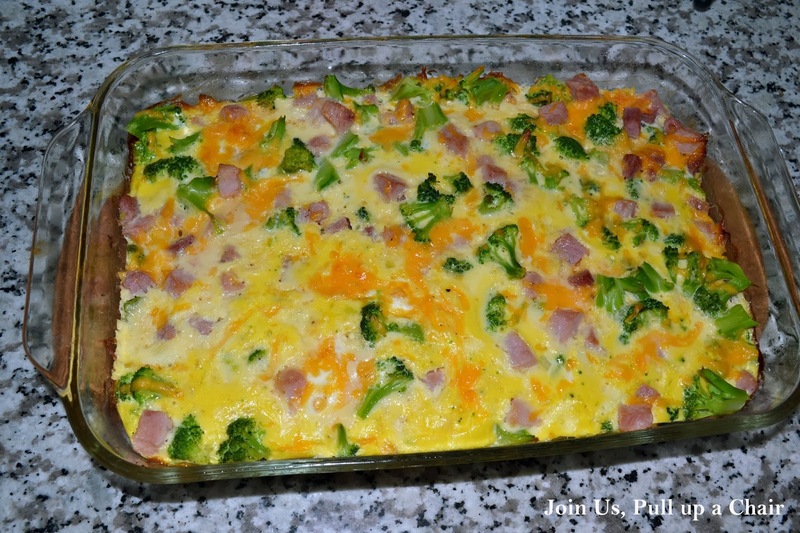 Layer the broccoli, ham and cheese in the prepared casserole dish. Season with salt and pepper and pour the beaten egg over the broccoli and ham. Use a fork to stir the mixture until all the ingredients are coated with egg. Bake 35 to 45 minutes or until the egg is set and the top is starting to lightly brown. Remove from oven and serve.